Professors Aloysio Janner and Ted Janssen (U. Nijmegen, the Netherlands) have made a remarkable contribution of exceptional distinction to the science of crystallography and are well deserving of the 10th Ewald Prize. What better time than during the International Year of Crystallography 2014 to recognize the tremendous achievement of these two eminent and highly regarded scientists? Aperiodic crystals are an interesting class of solids possessing long-range positional order yet lacking any defined periodicity. They are found in an ever-growing list of different systems: organic and inorganic compounds, minerals, metallic alloys, single elements under high pressure and recently also in soft matter consisting of large macromolecules, dendrimers, block copolymers, self-assembled nanoparticles in solution and even some proteins. Aperiodic crystals are typically classified into incommensurately modulated crystals, where an underlying periodic crystal is modulated with a wavelength that is incommensurate with the lattice constant. The lack of periodicity in these crystals precludes the use of standard crystallographic approaches for the study of their structure and physical properties; standard periodic space-group theory no longer applies. Phase retrieval methods and standard structural refinement tools do not work. With remarkable ingenuity, great creativity and mathematical rigour, the two Ewald Prize winners, along with the late P. M. de Wolff, were able to surmount all of these obstacles in a most beautiful way. Together with de Wolff, Janner and Janssen – who were at the time working on the relationship between symmetry and physical properties in condensed matter – conceived and developed an approach to understand these incommensurately modulated structures, which de Wolff described as being superimpositions of basic periodic structures, with a symmetry that can be described by a three-dimensional space group. Their work over the past 30 years has allowed for a rigorous analysis of the symmetry of aperiodic crystals and provides a unique route to understanding and solving their atomic structures. For this accomplishment de Wolff, Janner and Janssen shared the 1998 Gregori Aminoff Prize awarded by the Royal Swedish Academy of Sciences. 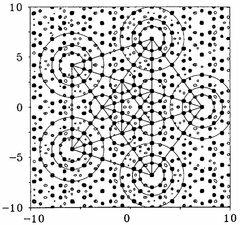 Fourier map of a decagonal plane of Al78Mn22 [A. Janner (1992). Acta Cryst. A48, 884–901; figure courtesy of W. Steurer]. Urea–alkane, an aperiodic crystal. Figure courtesy of Bertrand Toudic, U. Rennes, France. Thanks to de Wolff, Janner and Janssen, the field of superspace crystallography evolved very quickly. The use of the superspace approach rapidly became the tool of choice for solving the atomic structure of incommensurately modulated and composite structures. In 1984, when Shechtman's discovery of quasicrystals was announced, Janner and Janssen were able to extend their superspace approach to deal with these new and puzzling structures. Over their many years of research, it is perhaps difficult for these two scientists to select one crystal each that has particular significance; however, the IUCr can reveal their choices exclusively here and on the cover of this issue. Janner wishes to share his affinity with the decagonal quasicrystal Al78Mn22. He describes how, by looking at the Fourier map of this quasicrystal, he recognized a pentagram from the Fourier spots, which he was not expecting. The pentagram had already been seen as far back as the Sumerian civilization (3rd millennium BC), was later adopted by the Pythagoreans as a secret sign of recognition, and is also considered to have magical properties. The history, as you can see, is rich. What amazed Janner was how this pentagram was not drawn by people but by nature on atomic positions of an aperiodic crystal. Janssen highlights urea–alkane as his aperiodic crystal of particular interest. It consists of two mutually interpenetrating systems. One is a helix of urea molecules, which has broad channels in which the alkane molecules form another system; the systems do not fit each other. The combined system is a so-called incommensurate composite, and these materials are halfway between two other classes of aperiodic crystals: incommensurate modulated crystals and quasicrystals. The award of the 10th Ewald Prize to Professors Janner and Janssen represents the tremendous achievement in the field of these two scientists and will change how crystallography is practised for many years to come.